The fridge is often a sad place for bunches of cilantro and parsley, in my kitchen, at least. I loooove fresh herbs, and if a recipe calls for fresh cilantro or parsley, there's no way I'm skimping, but it's been a long--looooong- time since I've bought a bunch of cilantro or parsley and used it all before it began to wilt. Some times I'll sort out a bunch of cilantro straight from the beginning, and place in it a vase with water to keep it fresh for a few extra days. And it works, for a few days, but the last remaining stems always hang around until they're far past "usable". This recipe, though, is perfect for those just-beginning-to-wilt bunches of cilantro and parsley in your fridge. The only real problem is you'll fall in love with using Chimichurri sauce and you'll being buying parsley and cilantro just to make this recipe, and well, the vicious cycle of buying bunches of fresh herbs, using half, and letting the other half wilt will begin. At least, that's how it happened with me. Luckily, this sauce stays nice an fresh in your fridge for at least a week, so you can make a BIG batch (go ahead, use the entire bunch of parsley!) and then put it on everything you eat: eggs, sandwiches, burgers, chicken, fish--the list goes on. My number one favorite use of Chimichurri sauce right now: using it as a marinade for chicken and throwing it on the grill. Then topping that chicken with even more sauce. It's vibrant and fresh, making it the ultimate grill-out dish, when you tire of standard BBQ sauce. Plus if you, like me, have be wishing for a little vacation lately, this meal will remind you of somewhere south of the border... a little bit of South America in a bite! Use up bunches of cilantro and parsley to make this recipe! Please the onion, jalapeño, and garlic in the bowl of a food processor and pulse until minced. Next, add the cilantro and parsley, and drizzle in the vinegar and oil. Pulse until the herbs are minced. Add a few cracks of salt and pepper, and the oregano. Pulse 2 or 3 more times. Taste, and add additional salt/pepper to your preferences. If you prefer a spicier sauce (or you find that the jalapeño you used was quite mild), add a dash of cayenne to taste. Use a spatula to scrap sauce into a jar. For the chicken: Place chicken in a zip lock or shallow dish for marinating. Pour 3/4 of chimichurri sauce into container, and give it all a shake to ensure all of the chicken is coated. Cover (or seal zip lock) and place in fridge for 8-12 hours to marinate. When ready to cook: heat grill to 375-450°F. Place chicken on grill and allow to sear on one side for 5 minutes. (Discard any marinade that remains in the container). Flip chicken, and sear on the second side for 5-10 more minutes. Check that the chicken is cooked through before serving: cooking time will vary greatly on thickness of cut of meat. Juices should run clear and meat should no longer be pink. Serve hot, with reserved chimichurri sauce as a topping. So I'm sitting on the couch right now, curled up next to Oliver while he watches his new favorite show. His show ends, and I ask him, "What ten foods would you pick if you could only have ten?" (Welcome to typical us). He starts his list right away, a couple of basics -- I do the same. We get about half way, and then our list building process slows down. We realize ten is not very many. We start to make more calculated selections. After we get to about seven items each, we stop all together. It's a good thing we don't live on a deserted island. 1. White fish. Preferably Mahi-Mahi or Tilapia: they're both satisfying and when cooked they are perfectly flakey. They're also easy to cook (cod gets tough when cooked wrong, and if I'm on a deserted island I probably don't have a full kitchen). Not to mention, they're versatile! 2. Broccoli. I've always adored broccoli. It was probably my second favorite vegetable when I was a kid, right after zucchini. It's good raw, it's delicious steamed, but it's best when it's roasted. Heck, you can turn it into soup! 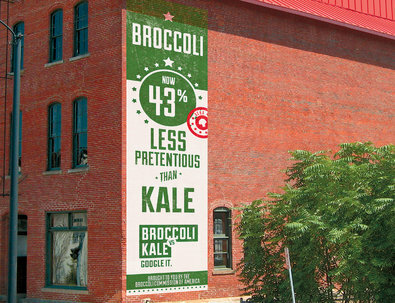 Maybe my love for the vegetable explains why this broccoli ad has a special place in my heart. 3. Coconuts. All hail the coconut! Seriously, if I were stuck on an island, an everlasting supply of coconuts would be my savior: first, you get coconut water. Then, the milk -- glorious, glorious coconut milk! Finally, coconut meat and coconut oil. Four food items in one -- is that cheating? 4. Cocoa powder. Did you think I was going to missing this one? Cocoa powder + coconut milk = 1 damn good glass of chocolate milk. I'd probably go crazy without my chocolate fix. 5. Apples. I'm all about their sweet crunchy flesh. Evidence -- the many many apple recipe on this blog (like apple cinnamon roll porridge). 6. Kabocha Squash. Even though Delicata Squash is my favorite squash, I think I would pick Kabocha. It has a satisfying, starchy quality that makes it taste rich. 7. Salt. I'd like to take other seasonings with me too, but there are too many to choose from! Curry powder + coconut milk + fish could make a pretty good dinner, but I know that'd get old. I always love thyme, but that would get old too. So instead I'm keeping it simple: salt. 8. Water. Do I have to say this? Can't this bee a free-be? Well, for anyone that thinks it must be included on your list if you want to consume it, I'm adding it to my list. Definitely wouldn't last long without water. 9. Onions or Garlic. I'm not sure which one. Maybe onions? They add so much flavor to everything, but then, so does garlic. Which would you choose? 10. Eggs. Ok, not only can eggs be cooked in so many different ways, they're also just the best breakfast food I can think of. If you have any doubts about this pick, just read Michael Ruhlman's book, Egg. 1 pieces of baker’s twine, about 10 inches long each. Dice onion and mince garlic. Using your hands or a strainer, squeeze extra water out of the spinach. Heat 1 teaspoon of coconut oil in a medium sized skillet. Once oil is hot, add the onion to the pan, and sauté until transparent. Add garlic, and then spinach. Cook until the spinach is warmed through. Turn off the heat. Assemble the fish: lay the slices of prosciutto out on a cutting board. Spread a thin layer of mustard over the middle section of the prosciutto (cover about 1/2 of the surface area— leaving 1/4 of the prosciutto untouched on each side). Place 1 fish filet on the top of the prosciutto, right where the mustard smear is. Season the fish lightly with salt & pepper. Finally, scoop a bit of spinach over the top of the fish, and spread into an even layer. Fold the ends of the prosciutto over the fish and tie closed using the bakers twine. Heat the remaining 2 teaspoons of coconut oil in a medium sized skillet. Once sizzling, place fish in pan. Cook for 3 minutes, then flip. Cook for another 3-4 minutes, until fish is flakey and opaque. Serve immediately. Update: This is an older recipe from Foraged Dish but still a good one! I updated it on 1/1/2019 (happy new year!) to make it easier and more clear. Plus — new pictures, and a video! One of the very first recipes on this blog was a homemade sriracha sauce. It — to my surprise - was it’s own small kind of hit. I was even asked if it could be included in a little magazine! It was the year of sriracha. The sauce was EVERYWHERE and I got lucky. You don’t, however, need to make your own sriracha to make these kabobs. In fact, the sauce here is as easy as adding 4 ingredients to a bowl. Sriracha, garlic, maple syrup, and coconut oil. From there you can basically do whatever you like. I use chicken, bell peppers, red onion, and zucchini but you could easily swap in steak or shrimp, and replace the veggies for something else grill-friendly, like yellow squash, mushrooms (I LOVE grilled mushrooms!! ), or even little cubes of pineapple. (If you like grilled pineapple, try these sweet and spicy barbeque shrimp & pineapple skewers). Compared to other hot sauces, sriracha is not very spicy — it’s a little sweet, in fact. This, combined with some maple syrup, turns into an ultimate grilling glaze. It comes out as a sweet and spicy kabob. Make some extra sauce for dipping, sprinkle with cilantro, and serve with a lime wedge if you have it. Make a complete meal by serving over a bed of rice! Most people would tell you that kabobs are a perfect BBQ, potluck, picnic, camping dinner. But I — crazy me - made these in January while it was snowing. 🤪❄️Watch for snow flake over the grill in the video below! Add garlic, sriracha, coconut oil, and maple syrup to a medium or large sized mixing bowl and stir to combine. Add chicken, bell peppers, onion, and zucchini to bowl and stir to coat in sauce. Assemble kabobs: put chicken and veggies on metal or wooden skewers, alternating ingredients (ex: chicken, bell pepper, onion, chicken, zucchini, etc). Heat grill to high. Place kabobs on hot grill and cook for 12 minutes with lid closed, turning every 5 minutes and brushing with any extra sauce. When juices run clear and chicken is cooked through, remove from heat. Garnish with cilantro and serve hot.